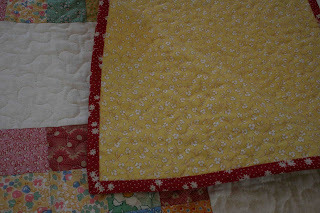 see, this is what happens when I try to take photos of my quilts. 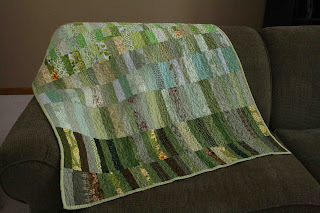 Yes, it's another happy hour quilt. 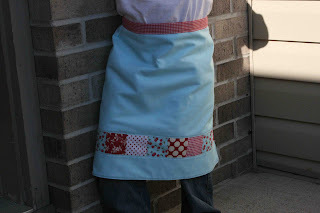 This is a great pattern for a beginner. 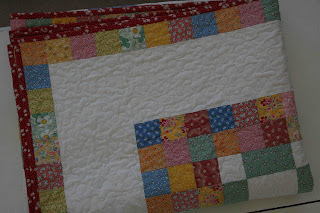 Aside from the cutting, (which is easy, but takes awhile) the quilt goes together in a snap. And it's a good way to show off fabrics with a larger print. 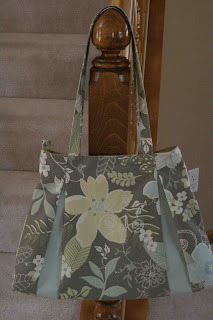 I used Heather Bailey Freshcut fabric, some Joel Dewberry and a few prints from Mill End Textiles. Oh, and there is some Denyse Schmidt fabric in there, too. 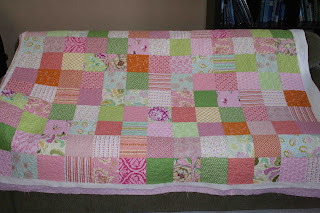 This time I used serger thread to quilt it. 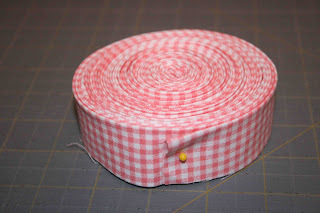 Although it's polyester, I love serger thread for a few reasons. It's thinner than the cotton stuff I usually use, so it blends in a bit better. And it comes on a spool with 3000 yards, so there is no danger of running out of thread during a project. I used light pink thread here and it blends in well, even with the green. 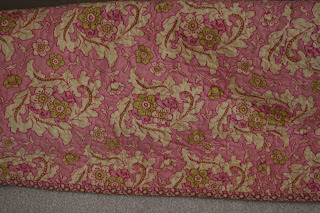 The quilt measures about 70" square. So this is the start of finish it up week for me. 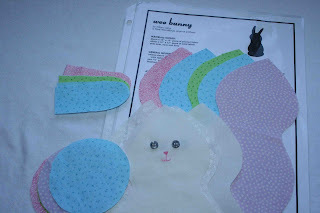 I have a bunch of projects that I need to complete, (pincushions, bunnies and quilts) so I am going to try to finish as many as possible. Anyone else care to join me? I'm finally back from spring break and a blog break...I was feeling burnt out. I'm happy to report that after some time away, I am feeling refreshed! It's friday, the sun is shining, I have a few new projects in the works and I have some Neil Diamond playing in the studio. Good times, good times. I hope your day is going just as well! 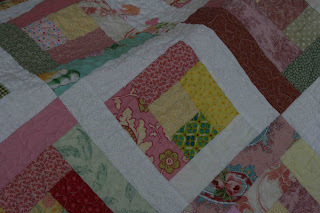 Thanks for all the wonderful comments on my last few quilts. Each and every comment is much appreciated. Thank you! You guys are the best. For next week, I am planning on hosting some sort of finish it up week. I have LOTS of projects in the works and I need a kick in the pants to finish them up. So say tuned. I hope you join me. 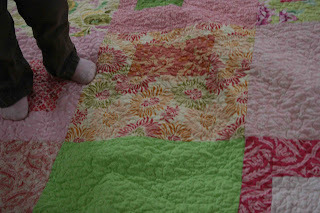 Oh, and my grandma loved her quilt! yay! She doesn't have the best track record for gift receiving...even my sister warned me not to be too disappointed if she doesn't gush over it. (So it's not just me being paranoid.) It was nice to visit her and give her the quilt for her birthday on her birthday. 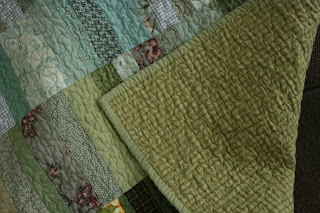 I finished the green quilt on Saturday during my virtual quiltathon with Anina. While I was uploading the photos to post about it, I realized that it's St. Patrick's Day today. Ha! I'm not crazy about this quilt. Maybe I'm just not a green girl. I do like this version better than the first version, though. I like the gradient thing that's going on. It is about 42"x45". The backing is flannel, which I feel puckers extra well. I usually have one quilt a year that I don't just love and I guess this one is it for me. Kind of early in the year to get that out of the way, but hey, what do you do? Next up for my monochromatic challenge will be blue. see the backing fabric peeking out on the left side? it's a marvelous little cherry print made by Robert Kaufmann. I had to bribe my little man to model this for me. one stick of gum does wonders. making 7 bunnies at once. I really dislike mass production. 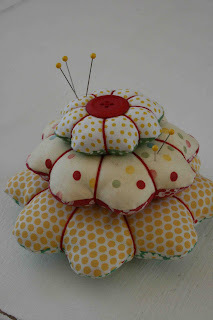 making a prototype before making multiples of these pin cushions. I learned a few things the first time through. the pattern came from American Patchwork and Quilting magazine, December 2007.
trying to tackle way too much gift making in one week's time. I only accomplished a fraction of what I wanted to and I am frazzled. oh, well. 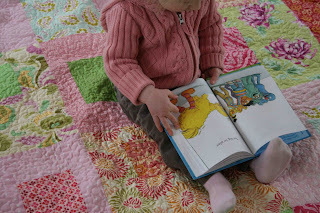 tomorrow Anina and I are having our own little quiltathon. woo-hoo! The gift making process is slow going. I keep getting sidetracked. 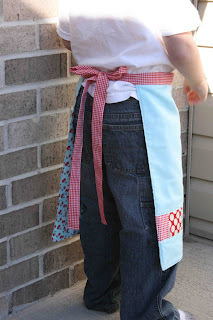 And then I get all nervous wondering if anyone would even want the things that I am making. They seem so...insignificant. I am not feeling too sure of myself with my gifting plan so far. This is the artsy clutch, again, from this book. I am going to be using this for a gift bag, essentially. For the loop closure I used the elastic thread that holds baby shoes in pairs when you buy them. Frugal or genius? Not sure. Miserly? Probably. It works well, because you only need a bit for each loop. Inside the bag will be some handmade cards, inspired by this book. 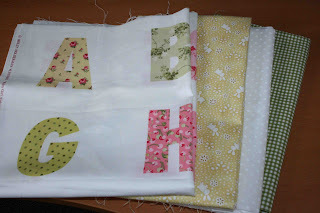 There is something really fun about sewing fabric to paper. If you haven't tried it, you really should! And here is probably my favorite card of the lot. The selvage tucked in there makes me happy. It doesn't hurt that it's pink, either. This week my goal was to make gifts for others. Like Jennifer and Melissa, I want a granny gift closet. But first I have to catch up. I am way behind and I need to send out several gifts. So what do I do? Make myself a present. This bag is a lot bigger than I guessed it would be from looking at the photos in the book and from the others that I saw. It measures 18" across the bottom. But I love the size and the shape. I love the fabric, too. It was in the bargain bonanza section for $1.29/yard. And it's decorator weight, so no interfacing required. Good news for me, as I loathe interfacing. The blue parts are cotton so I did need to interface those. They got all crispy and wrinkly. Any tips on what I am doing wrong? The interfacing is Pellon brand, so I don't know what the deal is. I added a loop at the top, to which I will attach a key ring, so I can hook my keys on it. (I usually spend 10 minutes rummaging in the bottom of my bag to find them. And in a bag this size, with all that it will hold, it would take even longer.) I put a plastic rectangle (template plastic) in the bottom to help hold the shape. 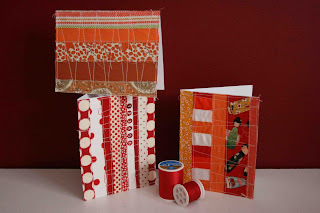 If you want to make one yourself, the pattern is in this book. I did add length to the handles...mine are about 28" long compared to the recommended 22" in the book. Other than that, I pretty much stuck to the pattern. Hopefully this week I will have more projects from the same book and more gifts to show you. For someone other than me. 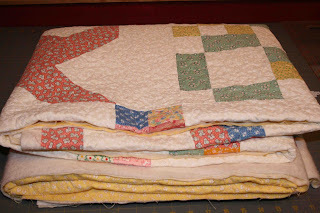 These are all ready for quilting. Two are mine and two are Heather's. 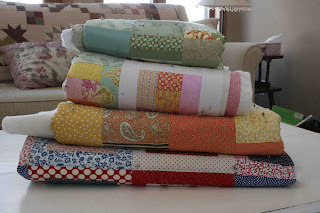 Oh, man, I am a sucker for a pretty pile of quilts. They don't even need to be finished. I am suffering from the winter blahs. I know, I know, everyone is. yesterday was particularly bad. 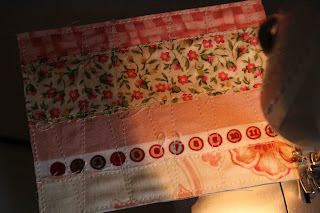 I haven't even felt like quilting (much), so you know it's got to be bad! I have a bunch of nearly finished projects, but nothing complete, and nothing is grabbing my attention. I keep telling myself that it has to get better. it has to, right? 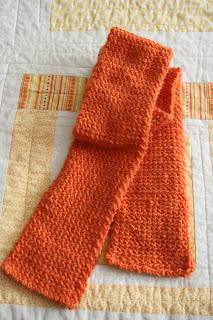 a thank you package from Marcia for hosting the quilt-a-long. 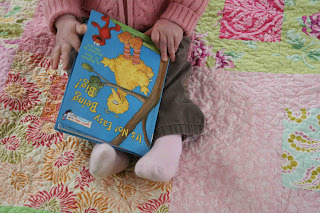 the piece on the left is the sweetest alphabet panel. I can't wait to make it into a quilt. and she sent coordinating fabrics. 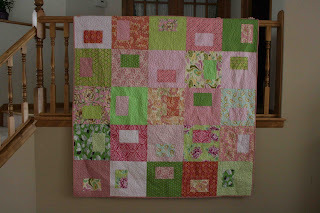 best of all, it's in my all time favorite color scheme-pink+yellow+ green! thanks Marcia!!! thrifted sheet for $1. I think it will become a quilt back at some point. (the thrifting is great in these parts, I tell you.) or maybe it will become some lounge pants. and...50% off 30's prints at my local quilt shop. how timely for me! 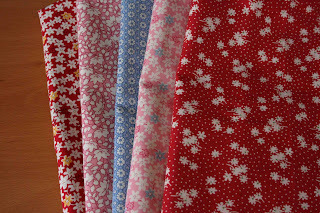 the red fabric on the right is the binding on my quilt-a-long quilt. I am half done hand stitching on the binding. hopefully I will have finished pictures tomorrow. 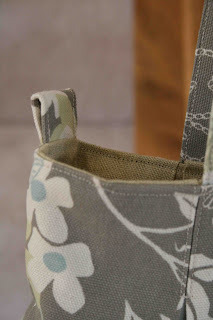 have you seen this seriously cute bag? oh, my, i love it! ...but sometimes I try to pretend that I am anyway. 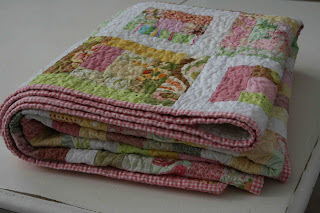 for those of you who asked questions about quilting in my last post, I tried to answer them in the comments. Welcome to the last week of our quilt-a-long! 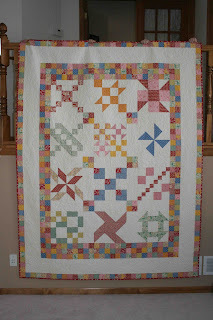 Today it's all about finishing up your quilt. 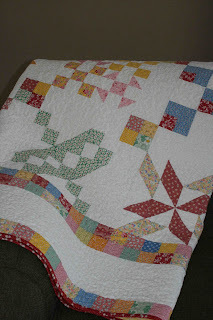 OK, so first off, I'd like to state, I am not an expert on free motion quilting, by any means! My husband (he is such a sweet man) helped me put together a video for today's post. For free motion quilting you will need to use a darning foot and drop your feed dogs. This will allow you to freely move your quilt with your hands rather than have the machine move it for you. 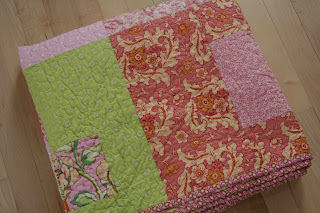 If you ever have a chance to take a machine quilting class, I would highly recommend it. 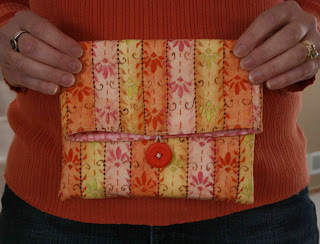 use the same color of thread on the front and back, so if the tension is a little off, it won't be very noticeable. 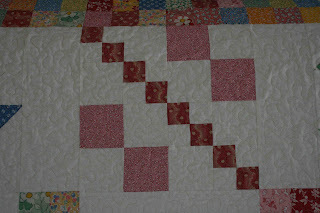 I have found it's very hard to quilt something using one color thread for the front and a different colored thread for the back. 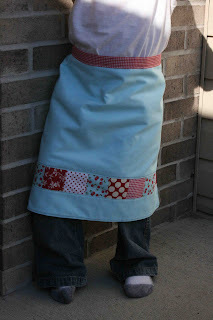 use a busy patterned fabric for the back of your quilt to help disguise mistakes. if your thread keeps breaking, change your needle. about managing bulk...I don't use any kind of clips or anything. 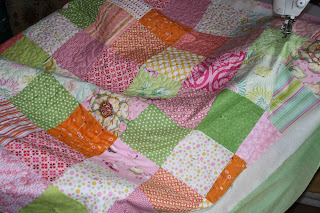 I re-adjust the position of my quilt as needed. (which is a lot.) I let the quilt bunch up wherever it needs to and work on a small portion at a time. 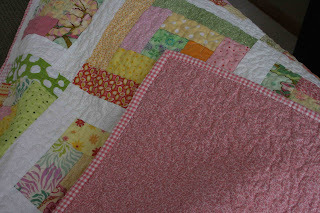 only half of the quilt bulk (or less) should be between the needle and the machine at any one time. I do not start in the middle of the quilt as some do. I start at one edge, and start stippling randomly, continually filling in the empty spaces. there are binding tutorials here and here. I'd recommend cutting your binding strips 2.5" wide. 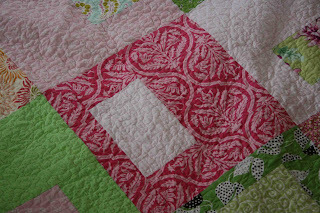 Label your quilt and enjoy! 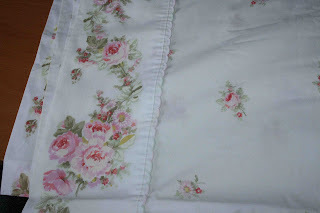 Oh, and if you want to instantly age your quilt, wash + dry it and enjoy the puckery goodness. 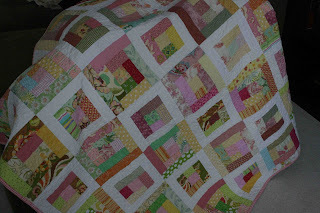 Thank you, thank you, THANK YOU for all of you who quilted along with me. It's been quite a journey, and I appreciate each and every one of you who have been on this journey along with me. It's been lots of fun and I appreciate you cheering me on and encouraging me along the way. It has FAR exceeded my expectations. I'd like to send a little something to the following people, picked randomly from the participants: Suze and Mikilana. Now, dare I say, any questions? I had a very productive quiltathon. When I posted my list I knew I was setting some pretty lofty goals. I started cutting out my happy hour quilt. I got 7 out of 25 blocks cut. Many many many thanks go to my husband who didn't complain one single bit about all the quilting that went on this weekend. He is a wonderful man. Just a few other notes about the weekend...I did go out on Saturday to deliver the quilt to Heather and pick up a pizza. On Sunday I went to church, so it's not like I stayed home all weekend chained to my sewing machine. :) The fridge was full of leftovers so there was very little cooking to be done. The kids played very well in their clubhouse (IKEA tent) set up in the living room and my husband worked on the computer while I was quilting. It was lots of fun. Thanks to Judy for hosting! 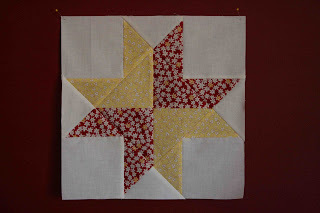 I am taking part in this quiltathon this weekend. 2. 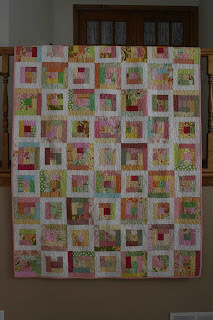 Quilt my 30's quilt. 3. 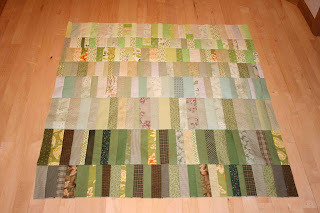 Assemble my green quilt top. 4. Making this stack of fabric into a happy hour quilt top. 5. Make the binding for this quilt.